I have tried many concealers over the years, but I currently only have these four in the collection as I use them all on regular rotation. 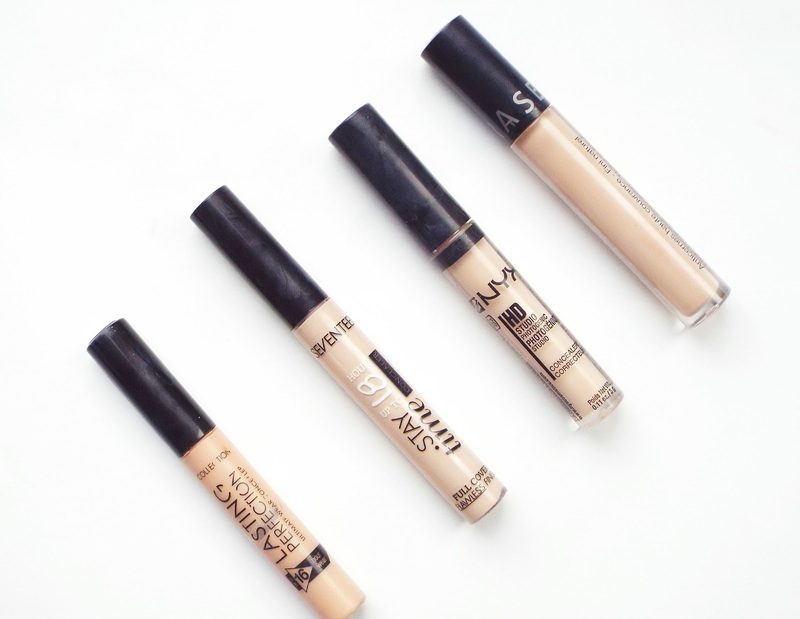 They all belong in the budget to mid point price bracket, and I think with concealers you definitely do not need to break the bank in order to get a decent all round product. I could not, not include the Collection lasting perfection concealer in this post as it is a firm favourite amongst many beauty bloggers. I must have purchased over five of these since my teenage years, as they cost just £3.99 and do exactly what I want it to. It offers a high coverage and I use this to cover over my blemishes and then set it in place with some powder. The only problem with this is its shade range. I am guessing that this is one of Collection's best selling products, so for it to still only come in three colours all these years later baffles me. It comes in light, medium and dark. I have used both light and medium over the years, but at the moment I am using medium as I still have a little bit of tan left from my holidays. I read about this Seventeen stay time concealer on a beauty bloggers blog about a year ago, and at the time I thought I might as well give it a go. I use this in the shade fair as an under eye concealer. I think this works well at brightening, and best of all it offers great coverage. It is nice and budget friendly at just £4.49, and I have bought three of these over the past few months. It is great for those days when you are really tired and you are going to be out and about all day long, but you still want to look fresh and awake. I bought this after another beauty bloggers recommendation for under eye coverage and I have not been disappointed. It is the NYX HD concealer which costs £6, and this is really great at brightening. I always notice a visible difference in my under eye area when applying this. It is lightweight and moisture rich meaning that the creamy formula is easy to apply without any creasing or cakeyness. A great option if your skin is slightly on the drier side of the scale. The Sephora high coverage concealer is the latest and most expensive (£14) addition to my concealer collection. First of all, I really like the applicator it is a flat wand which makes adding the product easy to apply. This comes in lots of different shades, I went for the shade 22 natural and it is a very good match for my skin as it has a slight pink undertone which is exactly what I need. This is a full coverage concealer which has a fluid consistency which makes application very easy. I will always opt for a fluid type consistency over a thicker, creamier texture as I find that they blend in so much better and do not dry out my skin. I have been using this over my blemishes and it has been working really well, and I have been impressed with its longevity.